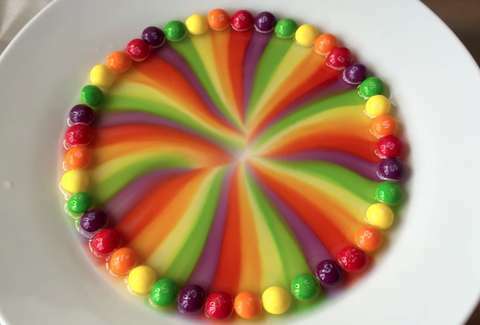 If you've got a spare 38 seconds today, you could do worse than stare at this YouTuber's incredible scientific feat: transforming a carefully curated circle of Skittles into a brilliant rainbow swirl with a single cup of hot water. The viewing experience is downright hypnotic. The dude's got some undoubtedly serious DIY skills. Think you're up for a copycat? Grab a pack and try your hand at painting the plate yourself, but remember to pour carefully. Nobody wants to watch these beautiful little buttons melt into gnarly brown sludge. Actually, on second thought, you might want to pick up two packs -- pretty sure you wouldn't want to taste that rainbow post-magic. Meredith Heil is a staff writer for Thrillist. Her flow sicker than a third floor in hospitals, her charm Starburst, her watch Skittles. Taste the rainbow with @mereditto.